The project features three one-day workshops, including presentations from academic researchers, heritage professionals and performance specialists. These events aim to showcase recent work, debate methodological and theoretical issues, and explore future funding and collaborative potential beyond the end of this one-year project. Workshop 1 took place on 26th October 2012 at the National Coal Mining Museum for England. This inaugural event established the impetus and rationale for the project, beginning with an introductory talk on the meeting points of archaeology and theatre by Prof. Jonathan Pitches (University of Leeds). The rest of the day showcased recent and ongoing projects combining performance and heritage undertaken by the three White Rose universities and their partner organisations. 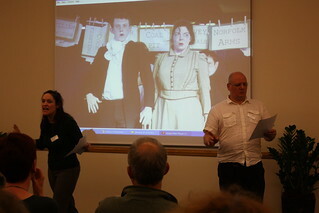 Dr Vicky Crewe and Prof Dawn Hadley (both University of Sheffield), and Steve Jackson and Amy Beard (Point Blank Theatre Company), presented their work on using performance to disseminate research into the 19th-century mining village at Manor Lodge in Sheffield. 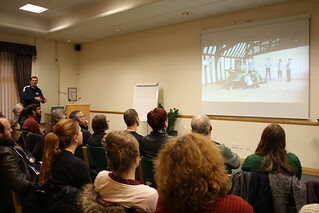 Dr Kate Giles and Dr Ollie Jones of the University of York addressed another of the project’s aims, namely the investigation of performance practices in the past itself, by presenting research into the archaeology of temporary performance spaces, such as guildhalls, during the Elizabethan era. A tour of the mine followed, and allowed the group to experience first-hand the National Coal Mining Museum’s use of narrative and performance in disseminating the site’s heritage. The tour was followed by a talk from Dr Polly Williams on her recently-completed AHRC Collaborative Doctoral Award project at Leeds, which studied the performative techniques used tour guides in the mines at the National Coal Mining Museum. Around 30 delegates attended the workshop, from diverse organisations such as the Universities of Sheffield, Leeds and York, Point Blank Theatre Company, Barnsley Museum Service, Red Ladder theatre company and York Archaeological Trust. The informal nature of the workshop provided plenty of opportunities for discussion and exploration, on topics such as reactions to the tour of the mine and the links between museums and performance, the latter being selected as a theme for Workshop 2. 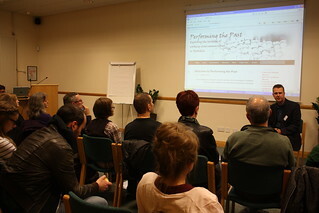 Workshop 2 was held on 22nd February 2013 at Barnsley Town Hall, the location of the town’s new museum, Experience Barnsley, which is scheduled to open in early summer 2013. The programme for the day focused on three themes: ‘Performance, Working-Class Heritage and Museums’, ‘New Research on Performance and the Past’ and ‘Working-Class Heritage on (and in) the Ground’. Dr John Tanner from Barnsley Museum Service started off the day with a talk welcoming the group to Barnsley and outlining plans for the new museum, including the role of performance in this space. Presentations from Dr Mark Westgarth and Dr Elizabeth Carnegie followed, and addressed the role of objects and the depiction of ‘working-class’ heritage in museums. 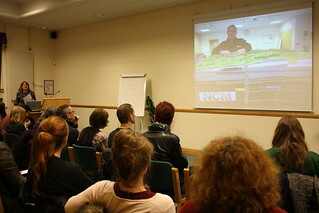 Further talks by PhD students showcased new research into local heritage and performance. Jack Windle discussed songs composed by Joseph Mather, a late 18th-century Sheffield performer whose songs were still being sung in the city in the early 20th century. Meanwhile Tiffany Webster considered stained glass windows and their role in negotiating the performance of mining heritage. Dr Catherine O’Byrne and Dr Helen Smith provided a brief introduction to two new short-term projects on political activism in Sheffield, which will feed into the production of a play. The workshop concluded with two talks on the theme of working-class heritage at two specific regional sites. Grace Tebbutt (Green Estate) discussed the role of costumed performance as part of the visitor experience at Manor Lodge in Sheffield, while Dr Jayne Rimmer and Jon Kenny from York Archaeological Trust presented their work on the archaeological remains at Hungate, exploring the idea of archaeology as a performance. Workshop 3 was held on 31st May 2013 at the Department of Theatre, Film and Television at the University of York. The programme for this event addressed such themes as performing rural heritage, and the problems and opportunities arising from enmeshing performance and historical research. The day began with a session focusing on the rural working-class history of northern England, with a talk from Dr Kate Giles on the heritage of the Yorkshire Wolds, specifically the ‘horse lads’ who worked the agricultural landscape in the early 20th century. Kate’s talk provided the context for the next presentation, which came from Stewart Howson, an independent playwright and actor. Stewart spoke engagingly about his experiences of creating plays about rural working-class heritage, many of which are based on real events and characters, including one on the ‘oss lads’ of the Wolds. The afternoon sessions saw the focus move towards a consideration of how theatre is employed in museums. Dr Bill McDonnell presented work he has undertaken with Museums Sheffield, reflecting on the use of real historical objects (in this case an 18th-century gibbet) as the impetus for performance, and the ways in which school and university students can be involved in disseminating history through theatrical performance. Prof Tony Jackson, meanwhile, reflected on his experiences of working on the AHRC-funded ‘Performance, Heritage and Learning’ project at the University of Manchester, which took place between 2005 and 2008. Tony talked about audience reactions to theatrical performances in museum spaces, illustrating the physical movement of audience members during a performance particularly clearly through time-lapse photography. The third and final panel saw two of TFTV’s own staff, Dr Tom Cantrell and Dr Tom Cornford, present elements of their recent research. Tom Cantrell spoke about his development of a verbatim theatre piece based on the experiences of workers in York’s chocolate industry during the 20th century. Meanwhile Tom Cornford ended the day’s talks with a theoretical consideration of the links between heritage and performance, drawing parallels between the two through concepts of apprenticeship, value and the tangible/intangible. You can find photos and sound-bites from the workshops in the Documentation section.